Only sizes that say; Availability: In Our Stock in the drop down option SHIPS NOW. If Any sizes are NOT in stock, Shipping will be in aprox. 30 days from the date of your order as this is a made to order item. Not the 7-10 days listed. SIZE 16 = fits 16 to 18"
SIZE: 18 = fits 18 to 22"
SIZE: 20 = fits 20 to 24"
SIZE: 22 = fit 22 to 24"
SIZE: 24 = fits 24 to 26"
SIZE: 26 = fits 26 to 28"
SIZE: 28 = fits 28 to 30"
SIZE: 30 = fits 30 to 32"
This Child single gun holster for kids is a hand tooled Black or Brown leather. A real leather gun belt or pistol holder made in the kids sizes. You can use this kids gun belt for a toy gun or the real pistol. 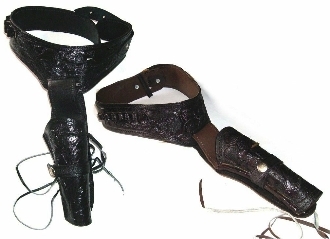 This is a fine quality leather holster made in the waist sizes that will fit a child up to 34 inch waist. This is the same exact holster as our adults, only in a child size. Will fit child waist sizes 16-34"
GOES GREAT WITH THE CHILD SINGLE TOY GUN (sold separate).